Plus, a farewell to Ici in Berkeley, and Pinky & Red’s secures its place at Cal’s MLK Student Union. Fans of Scend’s Restaurant on the Oakland/Emeryville border (3627 San Pablo Ave.) are scheduled to see the restaurant get new life soon — this week. The San Francisco Chronicle reported that Marshawn Lynch purchased the soul food restaurant in summer 2017 when its 80-year-old owner, Cassie Nickelson, decided to retire — effectively saving the restaurant from permanent closure. The restaurant now goes by the name Rob Ben’s; according to the Chronicle, it’s named in honor of Lynch’s best friend Robert Benjamin, who was shot and killed in Oakland in 2007 at the age of 25. Now, after over a year in the works, restaurant staff told the Express that they expect to open to the public on Friday, Dec. 14. The restaurant will serve breakfast, lunch, and dinner (although restaurant staff noted there will be no difference between the lunch and dinner menus). While the former Scend’s restaurant served fried catfish, fried chicken, mac ’n’ cheese, and red beans and rice, details regarding the new menus at Rob Ben’s are still in the works. Meanwhile, Eater SF broke the story last week that Ici’s two Berkeley locations in downtown Berkeley and the Elmwood district closed abruptly on Nov. 29. Ici announced the closure via Instagram. 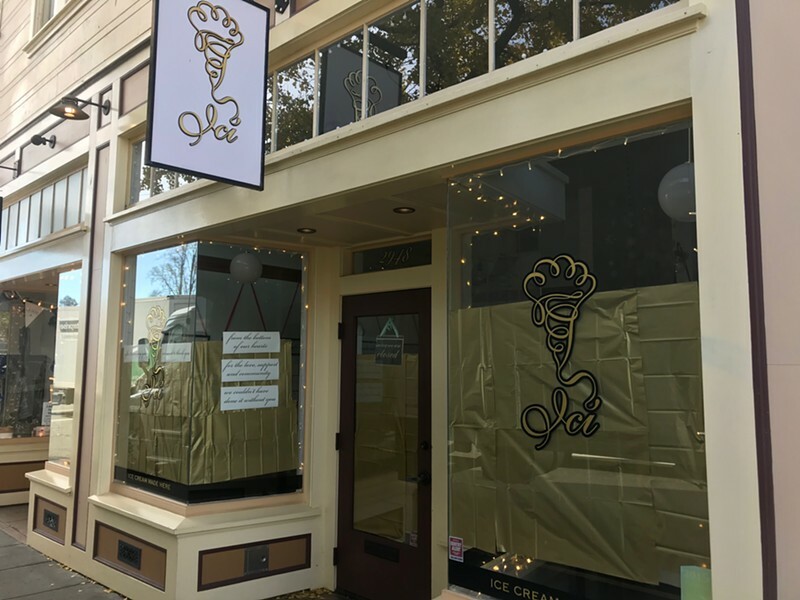 Ici ice cream in Berkeley closed abruptly on Nov. 29. “After 12 amazing years/We want to thank you from the bottom of our hearts/For the love, support and community/It’s been a wonderful ride/We couldn’t have done it without you/With gratitude — au revoir!! !/Mary and all that was Ici Ice Cream,” read the Instagram post. Similar signs were posted in the papered-up windows of the Elmwood location. Ici’s original location at 2948 College Ave. opened in September 2006 under the ownership of Mary Canales, who worked as a pastry chef at Chez Panisse for nine years. The storefront drew lines for its small-batch ice cream, sorbet, and ice cream cakes made using quality local ingredients. The shop set itself apart with flavors like Earl Grey and cardamom-rose-pistachio, as well as its hand-rolled, chocolate-filled cones. A smaller second location opened in downtown Berkeley at 2079 University Ave. in November 2017. The reason for the closure is unclear. The Express reached out to Canales for more information about the closure, but did not receive a response. And Pinky & Red’s, a Black-owned La Cocina eatery located in UC Berkeley’s MLK Student Union, has secured its place in the food court for another semester. The business is owned by Bernadine Sewell and Sicily Sewell-Johnson, a mother-daughter duo, and serves dishes like burgers and fried chicken sandwiches. A Change.org petition created by Cal’s Black Student Union stated that Pinky & Red’s was being threatened with potential eviction by the ASUC Student Union in order to make room for the nonprofit Berkeley Student Food Collective, even though Pinky & Red’s is profitable and had quickly gained a following within the Cal community. “The ASUC Student Union has additionally tried to push P&R [Pinky & Red’s] into verbal agreements without legal knowledge of the situation, has given mixed, changing messages to the owners since September, and has offered little to no certainty to a family that relies on that certainty in order to survive and thrive,” the petition read. The petition to keep Pinky & Red’s in the student union gained over 1,700 signatures within a week. On Instagram, Pinky and Red’s called for supporters to sign the online petition, write letters of support, and show up to the ASUC’s discussion on Thursday, Dec. 6. Later that day, the petition was updated to announce that ASUC had unanimously voted to keep Pinky & Red’s in the student union for the spring semester. “Because of you all, we have retained one of the very few Black businesses in Berkeley,” the update read.